Couples unravel and anxieties are revealed in this batch of urbane, wry and interior stories enlivened by Antrim’s talent for gamesmanship with words. Antrim's debut story collection—his first book of fiction since The Verificationist (2000)—sticks to a remarkably narrow set of premises. In “Pond, With Mud,” a hard-drinking New Yorker is losing his grip on reality and growing distant from his fiancee and young would-be stepson; in “Another Manhattan,” a mentally ill New Yorker is failing at the simple act of buying his wife some flowers before dinner; in “Ever Since,” a couple grows strained at a boozy New York literary party. This repetition of setups would be tiring were Antrim not so capable of conjuring a variety of tones and surprising amount of subtlety from these common predicaments. In “Another Manhattan,” for instance, the man’s illness is slowly and powerfully revealed by his inability to stop the florist from adding more and more flowers to the bouquet; as the gift absurdly blossoms, his despair falls into sharp relief. “An Actor Prepares” is a more surrealist look at emotional fissures narrated by a college acting teacher whose guidance to his cast of A Midsummer Night’s Dream reveals both his sexual fixations and romantic failures. And in the closing title story, a man left suicidal by a broken relationship heads back home and, through a series of misadventures, winds up navigating his car through a forest. 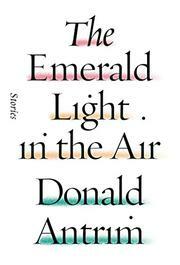 “The Emerald Light in the Air” refers to the sickly tint in the air before a storm, which captures the overall mood of these stories, where bad news seems to be just about ready to come raining down. But there’s wisdom and humor here, too; Antrim is attuned to the way couples struggle to make themselves heard or obscure their true feelings. A deceptively spiky set of meditations on romantic failure.